At last the final weekend of July arrived - our annual trip to the Snow Farm for the Ski Orienteering Champs. On Friday night, after a quick snack we left Dunedin and travelled to Wanaka. There wasn't much traffic and the trip was uneventful except for one of us needing to visit the Lawrence supermarket. Our accommodation was of course all taken care of. Some of us stayed at Albert Town Lodge, others at the Wanaka Holiday Park and yet others with friends and family. Saturday dawned clear and calm and we thought this must be paradise. At the Snow Farm, we were efficiently issued with ski gear and field passes and in no time at all the skiing began. 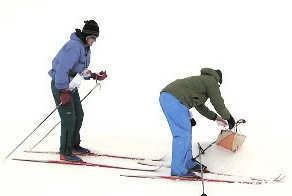 Most of us noticed that your skiing skills don't improve much when you only ski once a year on Ski-O weekend. However after a short warm-up run on Mary's Trail our group decided to spend the morning visiting Meadow Hut. The run there and back took about an hour and a half and by then we'd worked up a mighty appetite. I'm not sure that the afternoon's ski race was improved by the large lunch but it felt good at the time. Now, having a 'prologue' was an innovation this year and we were promised a short sprint style event and bonus points for the main event the following day. Lots of entrants were heard to say something like "it's not very important and I won't get any bonus points, so I'm just going to cruise around the course and look at the view". Well there's nothing like a bit of competition to spur people on and it was very noticeable watching everyone leave the start area that almost no-one was just cruising around looking at the view. In fact by the time they returned to the finish most people were in oxygen debt and perspiring freely. It was an excellent event and even when we found out the following morning that due to technical difficulties it didn't count for anything, everyone seemed to enjoy it immensely. Sunday brought a complete change from Saturday. It was cold and windy with snow and rain and quite miserable. However nearly everyone who had entered turned up for the main event. This was the Championship and consisted of a 90 minute score event. That means everyone gets the same map with 27 controls marked. They are valued according to their number and you have to gather as many points as possible in the time. There was also a severe penalty system for those who arrived back late so it required accurate planning of your route by the competitors. It was almost white-out conditions for most of the event and not only were the controls difficult to get in some cases but you could hardly see the tracks for much of the time. All this combined with glasses that kept fogging up, the odd navigational error and of course this writer's lack of nordic skiing skills made the event very challenging. This sort of event always brings out two distinct groups of competitors, the orienteers and the skiers. There is usually not much overlap between the two groups and so the competition is often quite even. This year the open men's winner was a skier and last year's runner up. That was reward for attending so many orienteering events during the year. Congratulations Antoine. The winner of the junior men's event however, was an orienteer who has spent nearly every free weekend of the last two seasons on the snow. Congratulations Andrew. I can't recall all the other results, except to add that I didn't get any particular placing myself. I was however, impressed by the Robson family of Mosgiel. Three generations from the one family took part, ranging in age from 6 to 73 years. It just shows the wide appeal of the event. Finally, many thanks to all the organising team, the event planners, the officials, the sponsors (nearly everyone got a spot prize of some sort) and of course, the Snow Farm. We arrived back in Dunedin around 9pm on Sunday night and will spend most of the coming week recovering. It was nevertheless a wonderful event and with over one hundred entrants, the largest to date. We are already looking forward to the last weekend of July next year.